Outlander Season 4 Episode 12 Recap: "Providence"
Lots of plot packed into season four episode 12 of Outlander, so let’s get right into it. The episode picked right back up with Roger (Richard Rankin) doing the ‘warrior challenge,’ as I call it, being beaten and struck with weapons. He’s pretty far down the line when one of the Mohawk warriors gives him a tomahawk chop, literally, in the shoulder. In a large amount of pain, as anyone would be, he drops to the ground clutching the wound. Since he doesn’t get back up, the tribe deems him a captive once again. In Wilmington, Fergus (Cesar Domboy) enlists the help of some of the town’s Regulators to concoct a plan to break Murtagh (Duncan Lacroix) out of jail. 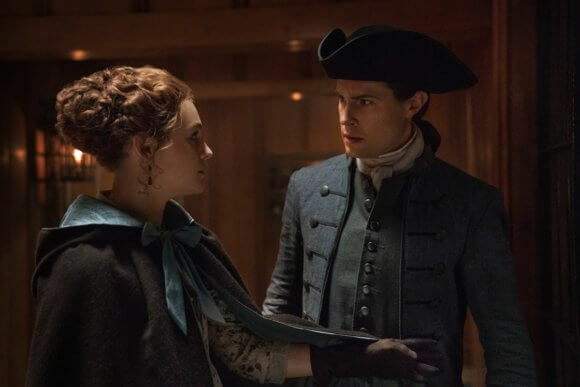 At River Run, Lord John Grey (David Berry) invites Brianna (Sophie Skelton) into the parlor to give her some rather weighted news. Steven Bonnet (Ed Speleers) has been captured! Brianna, looking as if she’ll faint, asks for details and Lord John shares all he’s been given. Bonnet’s expected to hung by the neck in a week’s time. Brianna turns as she’s leaving the room and tells, not requests, that she’ll see Bonnet before he hangs. Naturally, Lord John is stunned. Bree gives Lord John no time to react before walking away. Lord John follows her out on the front porch and immediately voices his protestations to the remotest idea of her taking the trip, much less watching a hanging, in her condition. Bree tells him she has no desire to watch Bonnet hang; she wants to speak with him. Lord John continues to voice his objections and Bree pulls out the letter Jamie (Sam Heughan) left her that Lord John delivered. Lord John reads the letter and it’s Jamie begging her to NOT seek revenge or murder of Bonnet herself. Bree agrees but also says the only way she can get to forgiveness is to speak with Bonnet directly. Just as the betrothed couple reach an accord, the baby kicks. Lord John asks to touch her belly and gets the first feeling that there is indeed a person under all that fabric. At the Mohawk camp Shadow Lake, Roger is used as a servant and charged with delivering wood to all the campfires. His arm is in a sling because of the wound he sustained, and the sling is the only treatment. He loads some wood into a basket he can hang around his neck. As Roger’s heading to one of the long houses, a female of the village with a bairn in her arms walks up to speak to him in French. The woman, Johiehon (Sera-Lys McArthur), gives him some herbs to chew that will help with his pain. As this small gesture of kindness gives Roger the slightest reprieve from his situation, Kaheroton (Braeden Clarke) is watching nearby. He walks over to break it up. Back in Wilmington, Brianna and Lord John exit the carriage. Brianna takes a breath and Lord John can see she’s unsteady at the sight of the town and the flood of memories that greet her. He offers her words of comfort and they speak of Claire (Caitriona Balfe) fondly. Bree hopes she’ll return to help deliver the baby and Lord John shares he misses her, particularly when he’s ill and appreciates her care. Lord John is always such a soothing presence in any situation, even the most chaotic. In the village, Roger continues to make the rounds to the fires to drop off more logs. As he reaches Kaheroton’s fire, he gives Kaheroton great offense by pointing to the spot in order to confirm the location he told him to drop the logs and interrupting him when Kaheroton is finishing explaining Roger’s next task. Unfamiliar with the Mohawk protocols, Johiehon has to step in to prevent Roger getting another beating. She explains that Roger could not possibly know their ways, so he was not deliberately giving offense. A village elder, Tehwahsehwkwe (Tom Jackson), approaches and determines Roger should be placed in a prisoner hut. Roger is unceremoniously thrown into the hut and hits the ground on his bad shoulder. The slight reprieve gives him time to finally eat the herb that Johiehon gave him for the pain. As he’s shoving the herb in his mouth to chew on as she ordered him to do, another prisoner makes his presence known. A priest, Father Alexandre Ferigault (Yan Tual), explains what the name Roger keeps hearing them call him means. It means dogface due to his beard. The priest informs Roger that he’s in Shadow Lake located in New York. Roger then asks why the Father’s in the prisoner hut. The good Father just simply replies that he fell in love. She starts talking things out with him, but Fergus begins to voice doubts in his ability to pull it off. Marsali is quick to tell him he CAN do this and free Murtagh with the help of local Regulators. They both reflect on how much they miss Jamie and Claire at just that moment. Jamie’s good at breaking people out of places, he has done it many times in Fergus’ life, and Marsali voices that she knows Claire had done the same for Jamie out of Wentworth prison. They agree it’s time they take Milord up on his offer to join them on Fraser’s Ridge. Getting out of town will be imperative once the deed is done, whether it’s successful or fails. Father Ferigault relays to Roger his tale about how he fell in love with a healer in the tribe after he fell ill a couple of years back. Being a man of the cloth, he saw the union as unholy and a complete affront to his vows of devotion and chastity to the church. Roger thought that the tribe was angry that this union produced a child, the very child Johiehon carries. The Father explains the tribe welcomed the union and the baby openly, but his downfall was when he refused to baptize the baby. The priest feels he would damn the child if he, as a fallen priest, pollutes a blessing upon the child given his fall from grace. Roger puts two and two together and realizes it’s the woman who gave him the herb for his pain that’s carrying the baby. Roger asks if the priest still loves her, and the priest admits that he does in breathtakingly lovely detail. Roger admits to the priest that he completely understands what he means. The hut door opens and Mohawk braves barge in, strip the priest naked, and remove him from the hut. The priest begs Roger to pray for him as he’s pulled away. Roger’s left alone in the hut and starts to dig at the back of the hut so he can escape. He hears the priest scream so stops his digging for a moment but continues right away until he hears the warriors coming back. They open the door and throw the wounded, naked priest to the ground and leave. Roger hurries over to see how the priest is after his ordeal and notices his bleeding is from the removal of his entire ear. Roger cleans the wound a little as the priest screams into the furs he lays on to muffle the sound. Being a good son of an adopted reverend, Roger offers comfort to the Father by praying for him aloud. He then gives him some water from the bucket in the hut. Roger asks what happened once the priest’s able to sit up and talk. The priest explains he was asked again to baptize the baby, and again he refused. Hence the reason for the removal of his ear. He’s been given until morning to change his mind and baptize the child. Roger asks what would happen if he doesn’t do it, and the priest describes the punishment of burning feet. He would be put on a slow and low burning pyre. The priest admits to having seen the punishment exacted on another man before. He confides in Roger that the condemned man took three days to die. Roger’s completely aghast at all of this. Roger tries to help by offering an alternative approach to sort of fake the baptism of the child since there’s no chance the Natives understand the official right as the church would have it. The priest understands Roger’s motives but says he can’t do that either. The priest views the entire situation as punishment for his fallen behavior and broken vows. Roger calls him an idiot and Roger goes into profound detail for the reason he can say that the priest is an idiot. Roger explains he has been a supreme idiot about Brianna and the path he’s taken since Brianna first rejected his proposal. Then the idiocy of chasing her across the ocean, and all the activities that led him to be a captive in the Mohawk village. The story includes his escape and standing at the stones. He, once again, was a supreme idiot for not taking the opportunity of freedom. His speech convinces the priest to help him dig the hole to escape from the village. The digging is something unique to the show; they don’t do that activity in the book. The pair dig throughout the night and into the morning, but they only get so far in their efforts. They both realize they’re out of time. The priest decides to sacrifice himself so Roger can continue to dig and get away. Roger’s extremely against the priest doing all this. After Kaheroton takes the priest away to receive his punishment for rejecting the third offer to baptize the baby, Roger’s distressed but regains his determination to dig his way out of the hut and escape. In Wilmington, Lord John and Brianna head toward the prison where Bonnet is being held. (We know Murtagh is in a different cell as well.) The jail house is being surrounded by a line of blasting powder by someone as Lord John and Brianna arrive. Mostly lawful in his endeavors, Lord John had sought the approval of the Governor to have the audience with Bonnet so the soldiers are aware and ready for the couple to enter the jail. In the book there wasn’t any such approval from the Governor – a week is not long enough for such activity. And in the book the head of the jail was corrupt and in smuggling league with Bonnet. Fergus finishes his task of lining the jail sides and back walls with powder, so it’s on to phase two. Brianna and Lord John head into the cells but Brianna stops Lord John from going all the way with her to the cell that holds Bonnet. She wants to face him alone, but Lord John will not let her out of his sight. He tells her he’ll remain within earshot if she needs to yell for any reason at all. Fergus and Marsali are waiting in a nearby wagon holding all their belongings. A few of Murtagh’s Regulator friends come walking down the street, and a few more join them, and eventually Fergus leads the group to the jail to execute the plan. The six men point pistols at the two guards to force the guards to open the door and allow them to enter the locked building. Brianna enters the cell where Bonnet is chained to the wall. He recognizes her face and ‘other things,’ as he puts it, when she asks him if he remembers her. Irish charm wraps his every response to her in their exchange. She reveals her pregnancy to him from under her cloak, and he claims many ‘whores’ have tried to foist their burdens on him. Brianna tells him the baby is his and she wants nothing from him. She makes it completely clear the baby will never know his name, or even be aware of his existence. She leaves out the part about it could be Roger’s baby, of course. In the book, she has a very similar conversation with him but it takes place down in cells beneath a warehouse. The warehouse is set to explode to cover the corrupt local captain’s exploits with Bonnet in the smuggling work they share. In the book, the captain knocks Lord John out and frees Bonnet from his cell. In the show, Bonnet remains in his cell through all the conversation with Brianna and the escape activity for Murtagh. Before Brianna leaves Bonnet’s cell in the show, he pulls a large gem from his cheek and gives it to her for the baby’s sake. She doesn’t want to take it initially, but, apparently, she struck a cord and he requests she take it as a dying man’s last wish – if she doesn’t want to take it for the baby. As Lord John’s waiting for Bree to come down the hall of cells, the six men enter to execute their escape plot to free Murtagh. Lord John, no slouch in protecting himself, slams one of the men to a wall before he recognizes Fergus pointing a gun at his face. Lord John lets the other man go and asks what is going on. Fergus informs him of their intention to free a prisoner. Fergus also informs the other men that they should not harm Lord John but that his allegiance is to Governor Tryon as well. The band of Regulators get the keys to the cells and make their way down the hall to Murtagh’s cell and free him. Brianna walks up behind all of this, much to Murtagh’s distress at seeing her. She informs him she was seeing Bonnet and didn’t know he was in jail. As everyone comes down the hall again, Lord John sees the situation in full as Murtagh emerges from the dark hall. Murtagh is equally unhappy at seeing his Lordship and that he brought Bree to the jail in the first place. Brianna insists they pick up the unconscious guard before leaving so he’s not killed in the blast. The party exits the building as Bonnet attempts to retrieve the keys from where the Regulator dropped them just outside his cell. The explosion covers the group as they scatter like ants abandoning a mound being covered with water. Murtagh and Fergus head to where Marsali waits with the wagon and hide in the back as she heads out of town. In the book, the warehouse is blown and it’s Bonnet who picks up an unconscious Lord John and drags Brianna along before the place blows up. He didn’t pick up Lord John out of the goodness in his heart, it was because Brianna wouldn’t go without him. And Bonnet had come back to make sure she got out of the warehouse for the baby’s sake, not her own. After they escaped through an underground tunnel, he gave her the gem for the baby. As mentioned, Murtagh wasn’t in the books at this point so naturally things had to unfold differently between the book and show. In the show, Lord John and Brianna are stopped by the soldiers in search of the escapees. Lord John doesn’t offer any information to aid in their search, and this makes Brianna happy. As I said, mostly honest Lord John. He’s also pragmatic when needs be. At the Mohawk village, Roger has been hard at work on his escape hole and has succeeded at getting it completed. Roger gets out of the hut as he hears the priest screaming on the burning pyre. Roger makes his way out of the village because everyone else’s attention is on the priest. As Roger tries to make his way through the woods, he argues with himself about every scream of the priest. He declares himself a stupid fool and runs back toward the village, certain he’ll be caught when he does return. He arrives to see the priest tied to the stake and standing on a pyre with a low-burning fire at his feet. Johiehon is standing in emotional agony before the burning man, holding their child, watching the man she loves tortured mercilessly. Roger, unable to stand the scene any longer, bursts forth from his hiding place in the forest to run into the gathering, grab a small barrel of whiskey and throw it on the fire at the man’s feet. Without a gun to put the priest out of his pain, the faster engulfing flames are the next best option to stop the prolonged agony of the man. In the book, the priest was burned on a typical fast-burning pyre and Roger did not escape the hut, hence the need for the show to put him back in there. Johiehon did burn with the priest of her own choice, but she handed her child to Claire in the book instead of placing it on the ground. If Claire was there at that time in the book, then, yes, Jamie and Ian were too. As you can see by the preview for the next show, they do find the village. We will anxiously await the season finale, which should be a very plot heavy and action-packed conclusion to season four. Je Suis Prest!! Previous Article‘Riverdale’ Season 3 Episode 10 Photos: Is Archie Really Dead?